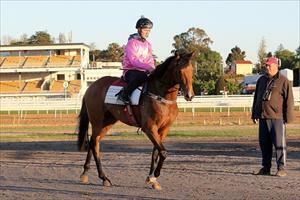 Crafty Lion is the sole runner for Ballymore Stables on Sunday when he travels to Geelong. Crafty Lion is in the first race, the Maiden Plate (2200m) at 10.40am and will be wearing the Pink colours for breast cancer awareness. Patrick Moloney will ride with Crafty Lion to jump from the outside barrier nine. The son of Mastercraftsman ran well last start when runner-up over 2224m at Geelong and Mike Moroney is expecting another forward showing. “He has trained on very well since his unlucky run last start and although he has drawn wide I think it will actually help him,” Moroney said. “He’s a free striding horse and drawn out there he will be able to get an uninterrupted run and settle into a rhythm.